Blackleg resistance seems to be losing its effectiveness for some varieties in some regions. That could be because the races of L. maculans (the pathogen that causes blackleg) present in a region or specific field are changing. One possible way to manage this is to rotate among canola varieties with different genetic resistance to specific L. maculans races. 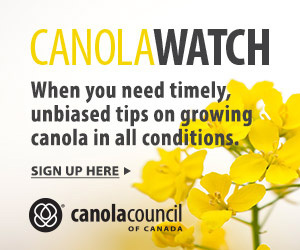 In order to refine this recommendation, we need a way to monitor which races are present in an area, and which resistance in canola is most effective in that area. L. maculans populations in Western Canada. These lines are for blackleg research and monitoring purposes only, and will not be for commercial production. The seven lines are Topas-Rlm1, Topas-Rlm2, Topas-Rlm3, Topas-Rlm4, Topas-LepR1, Topas-LepR2 and Topas-LepR3, named for the single blackleg resistance gene they each carry. All seven lines and the susceptible parent line Topas DH16516 were included in all eight WCC Blackleg Co-op Trials for 2013. The final BC5S3 lines are expected to be 99.8 percent homozygous and contain less than two percent of the donor parents’ alleles, thereby eliminating interference from other R-genes that may be present in other background material. Having the individual R-genes isolated in a common background greatly reduces ambiguity in assessing phenotypic responses and will prove to be extremely valuable to the blackleg research community, both in Canada and worldwide. It will also provide valuable insight into the effects of different genomic backgrounds on the expression of R-gene phenotypes. Figure 1. Resistance reactions of Topas Introgression Lines inoculated with different isolates (races) of L. maculans. These reactions allow researchers to determine which avirulence genes each L. maculans isolate possesses.